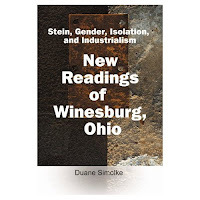 In Stein, Gender, Isolation, and Industrialism: New Readings of Winesburg, Ohio, I consider Gertrude Stein, gender roles, gay subtext, the machine in the garden, feelings of isolation, and attempts at communication, as they all relate to Sherwood Anderson's masterpiece. You can order it through most bookstores. Libraries can order it through the distributor Ingram Books; the ISBN is 158348338. Read more about this book at bn.com, Fishpond.co.aus, Fishpond.co.nz, Kalahari, Amazon.com, Amazon.Ca, or Amazon.co.UK. CH. V "MORE THAN MAN OR WOMAN"
As I begin to reevaluate the place of Sherwood Anderson's Winesburg, Ohio in the development of American fiction, I first want to look at Anderson's symbiotic relationship with Gertrude Stein, a relationship most Stein devotees will know about through her The Autobiography of Alice B. Toklas, in which Stein pretends to write as her lover, Alice. Anyone interested in Stein or Anderson should also read Sherwood Anderson/Gertrude Stein, edited by Ray Lewis White. This book features chronological excerpts from their letters to each other and from their published comments about each other. Anderson apparently came to love Stein through some of her portraits and through her 1909 book Three Lives. Stein generated considerable controversy with Lives, a controversy she would sustain with her subsequent works. In writing about the critical reactions to her prose, she sounds as frustrated as Anderson often felt, and much of what she says about her frustration could apply to Anderson, who appears prominently and constantly in literary anthologies and literary history books, yet continues to receive the label "marginal.” Stein says the newspapers claim "that my writing is appalling but they always quote it and what is more, they quote it correctly, and those they say they admire they do not quote" (Alice 70). The newspapers, however, reflected the general public, who found Stein's work fascinating and repulsive. Use the labels below to find Sherwood Anderson and Gertrude Stein links.